The second edition of this popular text systematically addresses all aspects of treatment of infertility using Chinese medicine. Clinically focused and with a new easy-to-navigate design, the book begins by covering all the essential fundamentals you will need to understand and treat infertility, before going on to look at what Chinese medicine offers in the way of treatment for functional infertility in men and women, gynecological disorders which contribute to infertility and relevant lifestyle factors. 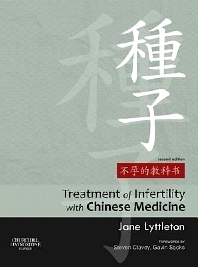 Jane Lyttleton importantly devotes a large part of the book to discussing ways in which Chinese medicine and Western medicine might work together to overcome infertility, and details the increased experience over the past decade in working with IVF patients and their specialists. Leaps forward have also been made in the understanding of conditions such as Polycystic ovarian syndrome and immune infertility. "The most valuable aspect of this text is the authorial voice - a voice not only of experience and knowledge, but that also shares similar concerns, challenges and questions as her readers...The text is generally well- if slightly sporadically - referenced, but there is much to learn here... If you are an acupuncturist or herbalist working with patients with infertility, you should own a copy this book. Both as a primer and reminder of the biomedical aspects of infertility, and as a clinical manual presenting an effective approach to TCM treatment, it is a sound and durable investment. Anyone new to the subject will study will study this text for years and still come back for more, whilst those who already own the first edition will find enough new material to warrant updating their existing copy."